In just the latest event honoring her service as secretary of state, newly-minted civilian Hillary Clinton today accepted a medal from the Defense Department for distinguished public service, and spoke of the "enormous" pride she feels for her work with the Pentagon during her tenure in the Obama administration. 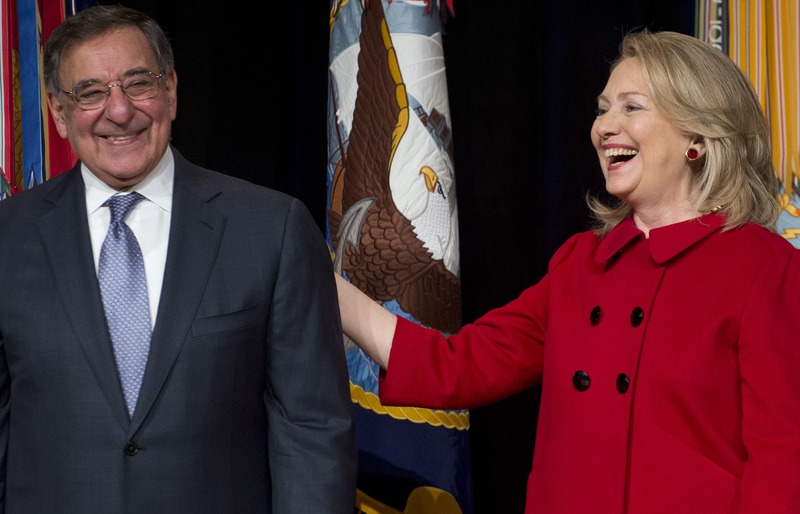 Clinton, who officially handed over the reins to the State Department at the beginning of the month, was profuse in her thanks and praise of outgoing Defense Secretary Leon Panetta, who presented her with the medal and introduced her remarks. Clinton reflected on the historically tense relationships between leaders of the Pentagon and the State Department, and said she was "enormously proud of what we have achieved." "I think we have gone a long way to restore America's global leadership," she said. As the government grapples with the prospect of looming across-the-board sequester cuts, Clinton also urged Congress to "avoid devastating and self-inflicting wounds." She argued that being on the "American" team is better for the country than being on a particular political team. "We have seen that America is stronger and more effective when we work together," she said. Clinton and Panetta have both participated in a slew of recent events marking their exits from the Obama administration - but as both pointed out today, only Clinton has had the chance to actually take a breather. Panetta's departure has been delayed amid ongoing controversy surrounding the confirmation of former Sen. Chuck Hagel, R-Neb., to succeed him. "Hillary and I are a little older, perhaps a little wiser, a little less patient, particularly with political dysfunction, a little less tolerant of B.S. in general, and it is probably a good thing at this point in time that we have a chance to get some damn rest," Panetta said, in remarks introducing his former colleague. "She's made it," he added. "I'm gonna have as broad a smile as she does, hopefully, in a few days." Panetta laughed and shook his head, noting that he was having a "hard time" waiting for Congress to approve his successor. "I'm ready to go," he said.